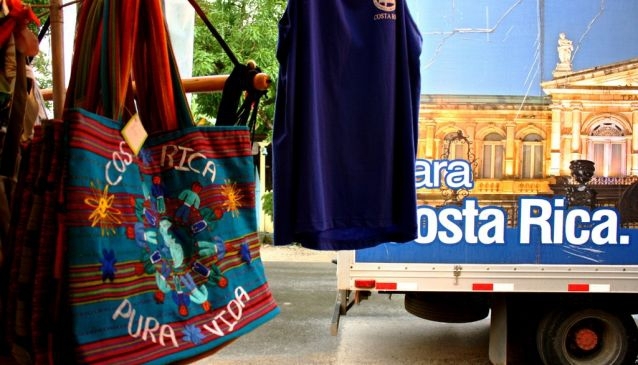 There are plenty of opportunities to get your shopping fix in Costa Rica. Modern malls, classic boutique stores, local street vendors and little shops tucked in and around the villages across the country are all waiting for your shopping dollars. A few quick tips, comfortable shoes and a pocket full of money will get you ready for a fantastic shopping experience in Costa Rica. Multiplaza, in Escazu, is perhaps the most popular and best known to locals and tourist. This modern multi-floor and upscale facility holds 365 shops with national and international name brands. Sony, Tiffany, Armeni, Timberland, Nike and many other easily recognized brands cater to the Central American shopping frenzy once you enter the doors of the Multiplaza. Five department stores carry an extensive array of those things you just have to add to your shopping cart, especially in the cosmetic, accessory and electronic departments. Teaser ads placed in the windows of the shops grab your attention and beg you to patronize the stores as you walk along the elaborate plaza. There are restaurants and small cafe's on the top level so you can take a relaxing break and catch your breath. Complete with a supermarket, cinema and financial center inside the Multiplaza, your day of shopping can be as extravagant as you want it to be in one spot. Another hot spot to check out is Plaza Real Cariari in Heredia. Clothing, jewelry, sportswear, cosmetics, toys, leather goods and even surf boards, to name a few, can be purchased inside this enormous mall. There are 2 large department stores with huge selections in the latest clothing lines, shoes, sporting goods and anything household you could want. If you happen to have children by your side while shopping, this is the perfect mall to give them an extra treat. There is a huge horse carousel in the center square where you can watch them get a big smile on their face. They often hold other types of entertainment for children around the carousel. If you need some energy in-between your shopping bouts, there are 23 different food galleries to choose from to fill your tummy. Restaurants, fast food or cafe's will give you a breather for your next round of shopping. Pay close attention to the accessory, jewelry, book and toy stores as they run great specials throughout the year. For a different kind of shopping day, try the Central Market in San Jose. This is similar to flea markets in other countries where individuals come to the marketplace with their assorted goods to sell. It covers one square block of the city and has many entrances on Av Central and 6th Street. Here, you will find some really unique items which you are not apt to find in the malls. While there are many spaces with sunglasses, purses, toys, household goods, shoes and other items for sale, you get a glance at the Costa Rican culture through the others. The Tico's know their wood and make beautiful artful objects and furniture with this knowledge. In most cases, ancestors have handed down little secrets from one generation to another to give that family mark of experience to their wares. Look closely and you will see the difference between the genuine and copies that are sold. The little "sodas" scattered throughout will be glad to serve you an authentic Costa Rican meal where you can sit and watch the crowds shop while you rest. Over 50,000 people head to the market each day so be prepared for the crowds. Outside of the larger cities, your shopping playground consists of boutique, specialty, souvenir and local variety shops. Don't be fooled when passing through a village that appears to have little or no shops off the main road. The terrain and land ownership often force these smaller shops to be off the beaten path. Usually making one or two turns into the heart of a village brings specific signs of what you can expect to find. Even most small villages have a local art, souvenir, and novelty stores. You may see coffee shops located in villages along with other clothing boutiques and souvenir stores. This is an indication you are in a coffee producing area of Costa Rica. We recommend that you stop, and grab some of the local varieties if you find them. A few reasons we suggest this are; the flavor is wonderful, you may pay more for the same thing in the city, all areas of Costa Rica will not have these types of shops, and it specifically helps that hard working coffee worker. If you happen to be a non-coffee person, consider they still make great basket gifts for special occasions. You will find these same circumstances with leather goods prevalent in the Northern Plains and unusual jewelry along the coastal areas. Lastly, the international residents of Costa Rica bring an enormous variety of shop ideas to the areas they settle in. Coupled with the rich handiwork of the Costa Rican people, you are bound to have fun shopping along your way in Costa Rica.